Adjusted earnings before interest and taxes (Ebit) for its renewables business segment was up 15.7% year-on-year, rising from €134 million to €155 million, the developer stated in its first quarter financial results. 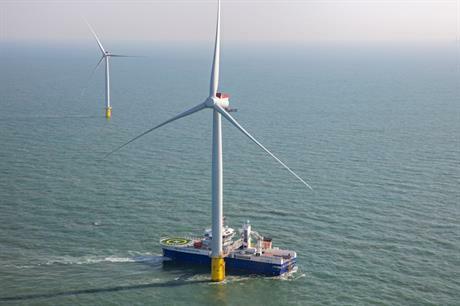 Recently commissioned projects, including the 353MW Galloper offshore wind site off the east coast of the UK, commissioned in Q1 2018, and the 332MW Nordsee One site in the German North Sea, commissioned in September, added to earnings. Power generation from renewable sources was up 7.4% year-on-year, from 2.7TWh to 2.9TWh, due to more favourable weather conditions, it added. Its total installed capacity rose from 3,487MW to 3,514MW due to Galloper’s commissioning, the acquisitions of the 23MW Deliceto project in Italy and 1MW Krusemark site in Germany, and the repowering of the 6MW Sommerland project. Investments in the division totalled €70 million in Q1 2018 — down 46.1% from the €130 million the business unit invested 12 months earlier. The number of staff employed in Innogy’s renewables unit rose from 1,669 to 1,763 by the end of Q1 2018. Revenue and operating profit (Ebit) for the wider Innogy group fell in Q1 2018. Revenue for the quarter totalled €11.63 billion, down 6% year-on-year, while Ebit was €1.23 billion, down 2% from Q1 2017. In March, E.on and RWE, which owns a 76.8% stake in Innogy, reached an agreement for a complex asset swap. Under the agreement, E.on will acquire RWE’s holding in Innogy, and in return, RWE will acquire a 16.67% "effective participation" in E.on. Innogy also formed a joint venture with Irish developer Saorgus Energy to deliver the 600MW Dublin Array wind farm off the east coast of Ireland. In January, it acquired a pipeline of 23 wind projects in Germany with a combined capacity of 400MW from developer Primus Energie.